Discrediting one’s opponents is a standard debating tactic and we are neither surprised nor dissuaded by such name-calling. So, why are we raising the issue today? Because this name-calling has migrated into the realm of academic science. We find that shocking because academia is a place where we expect reason to prevail and debates to be based on evidence, rather than ad hominem attacks. We have published several articles about the projects that are dumping rodenticides on islands all over the world to kill animals believed to be the predators of birds. The most aggressive projects are found in New Zealand where rodenticides have been aerial bombed on small islands for over 60 years. Recently New Zealand has made a commitment to expand that program to the mainland of New Zealand to kill all wild mammals that have been introduced by humans for over 700 years. New Zealand intends to be “predator free” by 2050. As you might expect, many people in New Zealand object to this program because rodenticides are an indiscriminate killer of animals, such as the native species of parrot, the kea, and many domestic animals such as dogs. There are other concerns as well, such as the feasibility of such an undertaking and the toxicity of rodenticides to the environment and to humans. One of the authors of that aggressive program is an academic at University of Auckland in New Zealand, James C. Russell. His defense of his program and the academic discipline of invasion biology on which the project was based was published by an academic journal. (1) It is an unusual defense, one that we wouldn’t expect to find in an academic journal, because it does not use scientific evidence to defend the annihilation of non-native animals. Rather it accuses those who question those projects of having ulterior motives: “Where evidence is disregarded, or motivations are disingenuous, arguments against [the negative impacts of] invasive alien species take the form of science denialism,” which Russell defines as “the rejection of undisputed scientific facts” such as the causes of climate change or the risks of smoking tobacco. “Science denialism typically originates from groups with a vested interest in opposition to the scientific consensus…” In other words, the profit motive explains the criticism of invasion biology, in Russell’s opinion. “…there is a strong correlation with support of free-market ideologies such as laissez-faire. ” Russell paints critics of invasion biology into a right-wing corner. Finally, Russell advises invasion biologists how to respond to “denialism” of their projects: “engage the criticisms but shift the debate from questions of scientific fact to questions of policy response.” And THAT is at the heart of the matter. Russell advises his colleagues to emphasize the policy goals, such as exterminating all wild mammals from New Zealand, rather than debate the scientific justification for that project. Since there is little scientific justification for this project, that seems like good advice. So, what is this advice doing in a scientific journal? That is the final question. A few months after Russell’s ad hominem attack on academic critics of invasion biology, the same scientific journal published four rebuttals to Russell and Blackburn, written by 11 academic scientists. As psychologists have informed us for decades, it is a short step from animal abuse to human abuse. The child who kills animals often becomes a killer of humans as an adult. Professor Russell seems to be proud of his collaboration with the US military. In any case, he stands to profit from that collaboration. That’s ironic, given that one of his criticisms of the critics of invasion biology is that they have “vested interests” in their criticism. It seems that a grant from the US Military should be viewed as a “vested interest” in his advocacy for killing animals. And, as he says, he is “in the business of eradicating” animals. Invasion biology as presently defined by academic science originated in the late 1950s. It began as a collection of hypotheses about the harm that non-native plants and animals were doing to native plants and animals. Like all hypotheses, it was based on speculation that had to be tested in the real world. In the past 25 years, many studies have been conducted that were designed to prove that non-native species are harmful to native species. With few exceptions, these studies came up empty. More often than not, studies found pros and cons to introduced species, just as we would expect of similar studies of native species. There is little evidence that invasion biology is an accurate description of how ecosystems operate. When academic scientists are forced to resort to name-calling to defend invasion biology it no longer deserves the status of scientific hypothesis. And when it is discredited as a scientific discipline, it must be just a matter of time before the public realizes that there is no legitimate reason to kill non-native plants and animals. We don’t see any sign of that paradigm shift, but we are hopeful that public policy will eventually be revised to reflect the reality that has been revealed by scientific studies. In the absence of scientific justification for eradication projects, they must be treated as public policy decisions. In a democracy, public policy decisions must reflect the public’s wishes. In the absence of public support, these projects will continue to cause conflict. Thanks for addressing this issue. I can live with name calling but it doesn’t make for the public discussions that are needed. In New Zealand we have no public forums for fruitful interactions. And the public were never asked how we felt about the Predator Free 2050 and what the implications this would have on everyday life for every parent or pet owner and the massive amount of poisons being used. I understand and am sympathetic to your desire for public input on policies such as PFNZ. However, I can tell you from experience that public input is not a panacea. In the US, the public usually has an opportunity to express their opinion of such projects during an environmental impact review that is mandated by federal and state law. Unfortunately, even when tens of thousands of people (sometimes hundreds of thousands) object to such projects, the projects are rarely revised or abandoned. The only strategy that has been successful (sometimes) is lawsuits. Of course, I don’t know enough about New Zealand to know if you have the same options. The name-calling associated with objecting to these projects is only noteworthy because it is now taking place among academic scientists and being published by scientific journals. That is new and it is both disturbing and encouraging. When scientists don’t have scientific evidence to defend their destructive projects, they are no longer scientists. Invasion biology is clearly on the ropes. In any case, I admire your opposition to PFNZ and I wish you the best of luck to stop this dangerous and murderous project. Thanks for your comment. What the nativists are doing in Aotearoa/New Zealand is heart-breaking and enraging, just like what we are dealing with in the US. Russell sounds like he’s projecting wildly, which is also what they do here. He and other nativists are dedicated to lies for profit and they are on the right wing side of the issue. The Maori brought Kiore, the Polynesian rat/Rattus exulans) to New Zealand for a reason. Some say food, but, knowing other rat species, I also wonder about love and companionship. Since there are no other native mammals but bats in Aotearoa, the birds have filled all ecological niches, including as carnivores and omnivores. And that makes all those rare, native birds particularly vulnerable to rodenticide. Part of what is enraging about nativists is that, in spite of their pompous arrogance, they do not seem too bright and refuse to use common sense. But I guess repeating lies is what often works. I met Kea just once, 34 years ago, and it’s hard to not fall in love with a wild animal who grabs you by the shirt, demanding food in such an adorable, endearing way. I got a few small photos that shows their beauty and sense of humor. It is horrifying that anyone would participate in killing such intelligent and wonderful beings. I’m to where I will never believe any animal’s life is worth less than the nativists who are set on killing so many and destroying entire eco-systems, which will end up killing humans also. A quick check on Google suggests the kea’s is a sad story, but collateral damage from 1080 spraying to kill possums which eat kea eggs and hatchlings is only part of the picture. If you ate NZ lamb before 1986 when the bird was officially protected you are also guilty, because the bounty on keas before then was to assist the sheep industry. It seems ingesting lead from buildings is also a problem. Don’t blame the nativists, blame the whole human race with its penchant for colonization and upsetting ecosystems in its own interests… Yes, there may be collateral damage, but NZ’s Department of Conservation aims to protect the integrity of native ecosystems, not destroy them. Yes, Patsy, there are probably many factors that threaten the kea as well as other species of plants and animals. We probably don’t fully understand all the factors and how they interact. That does not contradict the fact that rodenticides are killing keas. Please read the chart in the article on which you are commenting. There are many factors that threaten mammal species and “invasive species” are a minor factor compared to others such as habitat loss. 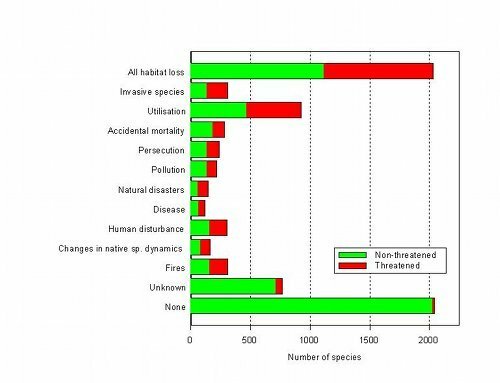 There are similar charts for other categories of species and they are much the same in their assessment of threats. Nativism in the natural world scapegoats other species of animals and plants just as nativism in the human realm scapegoats immigrants. It is perverse to claim that dumping rodenticides from helicopters will “protect the integrity” of ecosystems. “Integrity” is one of the most inappropriate words in the nativist lexicon, an extreme case of double-speak. Nature does not stand still, to conserve what is there now will not preserve it for the future. The seeds of the Entada gigas can travel large distances on the sea currents and still have the ability to germinate. The plant will survive when the climate/environment is suitable not the border of the country, or the human criteria. Animals also transfer seeds from place to place, it helps to diversify nature to bring in the new to live with the old and in some case the old with the new. There are many new theories about how we can help nature to survive using poison is not one them. Thank you for this excellent article. I’ve researched widely around the rationale behind New Zealand’s thirst for killing non native species. Invasive biology is little more than wildlife racism. Advocates for elimination of plant and wildlife species which have been introduced by humans resort to personality attacks because their science is in tatters, industry driven, it simply follows the money. 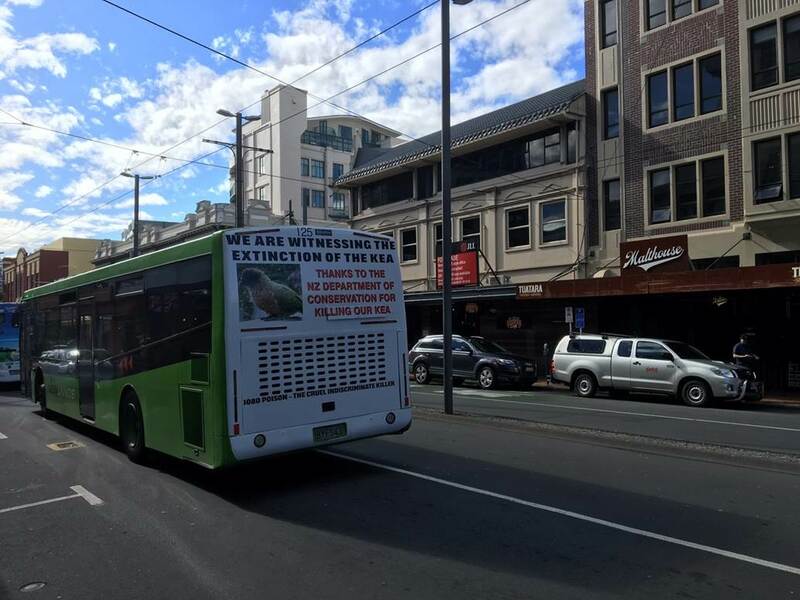 The historical drivers of New Zealand’s wildlife racism are political and ideological. Political because NZ derives most of it’s money from farming so any wildlife species that interfere with farming’s profitability gets money devoted to eliminating that “pest”. Ideologically because of an incorrect assumption made by 1920’s botanists that NZ Forests evolved without significant browsing and grazing. This could have been excused in the 1920’s but it is inexcusable today because we now know of the huge impact of the now extinct large Moa birds, 3 metres tall from studies of their fossil record. New Zealand has numerous plants which show obvious adaptations to withstand browsing. New Zealand’s native bird species evolved with a full suite of native predators. To suggest that native species will become extinct because some of these predators have been replaced by mammalian predators is laughable. Lack of food from habitat loss and now indiscriminate and widespread poisoning of natural forests by the nativists is what is responsible for shrinking populations of wildlife today. My university training was in population ecology and predator prey relationships. The broad principles are summarised by British ornithologist David Lack’s books around this subject and elsewhere in the world. There have now been 9 books written dedicated to ending the nativist ideological support for wildlife destruction by state sponsored helicopter poisonships in New Zealand. The latest is .“The Killing Nation New Zealand’s State-Sponsored Addiction To Poison 1080” 193pp author Reihana Robinson published 2017. (available on Amazon) The USA equivalent would be “Slaughter the Animals, Poison the Earth” by Jack Olsen SBN 671-20996-5, published 1971, its good follow on from Rachael Carson’s “Silent Spring”. New Zealand’s Predator Free 2050 vision and the marketing of New Zealand as a world leader in the technology of eliminating wildlife predators is an embarrassment, destined for the scrapheap once political leaders realise how they have been conned by a fraud not much different to the financial scams of recent years. Jim Hilton BSc Hons Biology, retired Wildlife Biologist and former NZ Government Scientist. Thanks for your visit and for your informative comment, including new references for me to explore. I have only read Bill Benfield’s book and many journalism articles about the controversy. I am intrigued by this statement in your comment: “native bird species evolved with a full suite of predators.” The conventional wisdom is that the birds of New Zealand are flightless because they had no predators prior to the arrival of Polynesians. Can you tell me more about the predators prior to the arrival of humans or point me to a reference about them? Thank you for your help to understand and accurately report about this complex and controversial issue. Even a lay person like me can see the gaping holes in Hiltons comment. NZ birds species evolved in the presence of avian predators that hunted from the air by daylight. The prey species adapted with camouflage and by being absolutely still in the presence of a predator. Hilton has failed to distinguish the difference between the evolved predation and the introduced. Introduced predators hunt by sight, sound and smell at night. Eggs and chicks have no defence. Another gaping hole in Hiltons theory is that species loss has happened in habitats that are not lost to agriculture. There is no lack of food there due to habitat loss. Any lack of food is due to introduced mammals and invertebrates such as possums, rats and wasps. Many thanks for this clairvoyant article. I am one of the authors who had been labelled as a denier by Russell and Blackburn. As other authors, I have published a reply in TREE journal. However, I am still very surprised that such a bad faith attitude has not been reported by other blogs and journals. I think this article from ‘Death od a Million Trees’ should be submitted to a scientific journal as an opinion paper. The attitude of some invasion scientists such as Russell and Blackburn has become absolutely unacceptable. Thank you, Mr. Tassin. Yes, I noticed your name in that prestigious group of the most critical thinkers about invasion biology. Although I have read the other authors on that team, I am sorry to say that I have not read your books because I cannot read French. Thank you for your participation in the response to a low-point in the interminable debate about the value of novel ecosystems. And thank you for your kind words about this article on Million Trees about that debate. I hope it will help the people of New Zealand to understand how empty the arguments for “Predator Free New Zealand” are.